An antibiogram is a summary report of antimicrobial susceptibility testing data from patients, which can provide valuable information for healthcare and for public health. When patients present with an infection, a sample from the infection site is routinely collected to help clinicians determine the cause of infection and select the most effective treatment. The sample is submitted to the laboratory, where tests are conducted to identify any pathogens. If bacteria are identified, antimicrobial susceptibility testing is performed. Antimicrobial susceptibility testing provides information on whether the bacteria are susceptible or resistant to specific antibiotics. This information can help clinicians decide which antibiotics are most appropriate for treatment as antibiotics can kill or inhibit the growth of susceptible bacteria but will have no effect on resistant bacteria. 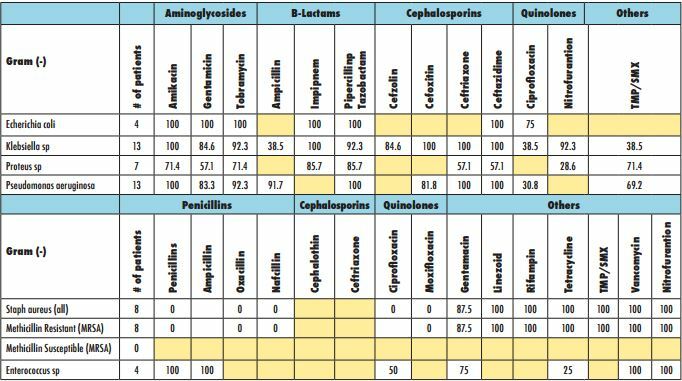 Antibiograms show the percentage of bacteria from an institution that are susceptible to the antibiotics normally used to treat them. These reports, which are typically produced annually, can show trends in antibiotic resistance within a healthcare facility or geographic region. Antibiograms can also assist clinicians in making initial antibiotic treatment selections for a patient before their individual susceptibility results may be available. 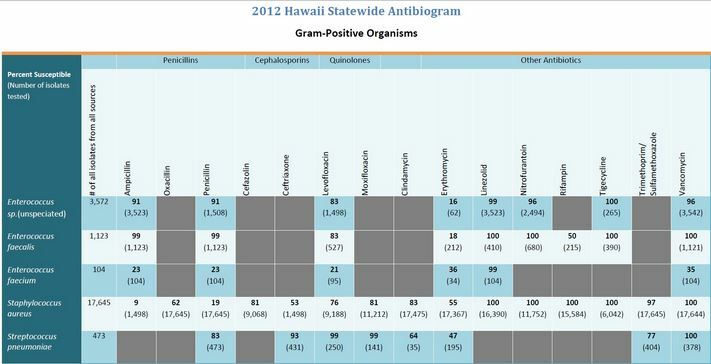 The Hawaii State Department of Health has collected antibiograms submitted by the four major clinical laboratories throughout the state and compiled them to produce annual statewide antibiogram reports. While these statewide antibiogram reports are presented for surveillance purposes only, they give public health officials insight on statewide susceptibility rates and resistance trends over time. 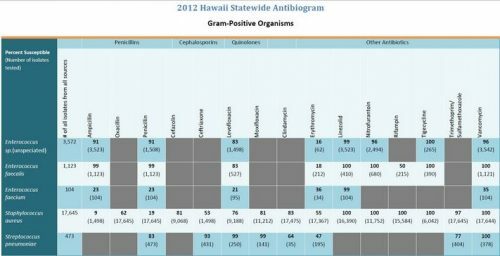 The statewide antibiogram report can also assist in promoting the judicious use of antibiotics, a key goal of the Hawaii Antimicrobial Stewardship Collaborative (HASC). Please click on the links below to view the Hawaii Statewide Antibiograms for Selected Bacteria of Public Health Significance.